Besides being the Ember Friday, today is the feast of Saint Pio of Pietrelcina. I regret that I wasn’t able to post this earlier today. Almost immediately after the Second Vatican Council, a terrible identity crisis of enormous proportions began to overtake the Catholic priesthood and thousands of priests left the active ministry with or without the requisite permission. Still others became genuinely confused about the nature of their priesthood. Unfortunately, the disorientation still remains in many ways. Its causes, no doubt, are quite complex and ultimately we must confess that “An enemy has done this” (Mt. 13:28). Some writers claim that Vatican II is itself partly responsible. As they see it, Vatican II, in its desire to act against Roman centralization and an overemphasis on papal primacy, glossed over the problem of priesthood. In any case, it certainly intended to highlight the role of the college of bishops as successors of the Apostles. Moreover, on the basis of Scripture, it proclaimed a truth that had hitherto been too often overlooked: the sharing of all the baptized in the priesthood of Christ. By these two emphases, the Council seems to have spoken as if the bishop and the people of God were the only necessary elements of a priestly Church. In so doing, it somewhat neglected the place of the simple priest (or presbyter). The Council indeed maintains the special character of presbyteral priesthood as differing in essence from that of the baptized. But whereas it refers to a half dozen Scriptural texts to confirm the reality of the common priesthood, it cannot adduce a single text in favor of the famous essential difference. The contrast between the two successive passages of the Constitution on the Church is striking: the first, and very welcome one, on the priesthood of the faithful, is based on Scripture, the second is nothing but a theological development based on some texts of Pius XI and Pius XII. The bishop, who continues the mission of the Apostles, easily finds in Scripture the justification for his existence. But the priest can base his own special character only on papal statements. Although the Second Vatican Council emphasizes that the common priesthood and the ministerial priesthood “differ from one another in essence and not only in degree” (Lumen Gentium 10), the nature of this distinction has not always been clearly perceived. The ministerial or hierarchical priesthood of bishops and priests, and the common priesthood of all the faithful participate, ‘each in its own proper way, in the one priesthood of Christ’. While being ‘ordered one to another’, they differ essentially. In what sense? While the common priesthood of the faithful is exercised by the unfolding of baptismal grace — a life of faith, hope and charity, a life according to the Spirit, the ministerial priesthood is at the service of the common priesthood. It is directed at the unfolding of the baptismal grace of all Christians. The ministerial priesthood is a means by which Christ unceasingly builds up and leads his Church. For this reason it is transmitted by its own sacrament, the sacrament of Holy Orders. While fully accepting the explanation proffered by the Catechism that “the ministerial priesthood is at the service of the common priesthood”, that “it is directed at the unfolding of the baptismal grace of all Christians” and that it “is a means by which Christ unceasingly builds up and leads his Church”, I am inclined to believe, with Fulton Sheen and Father Feuillet, that the concept that we have already begun to explore of the ordained minister as called to be “priest and victim” provides an insight and challenge far richer and deeper which has yet to be assimilated in the postconciliar Church’s teaching and praxis. What I would like to propose further is that God has set his own seal on this explanation in the person of Padre Pio of Pietrelcina. Is it not significant that even before the great disruption of priestly life in the twentieth century was underway the Lord had already chosen Francesco Forgione to illustrate in a dramatic and extraordinary way the call to embrace victimhood in order to realize fully his vocation to the priesthood? 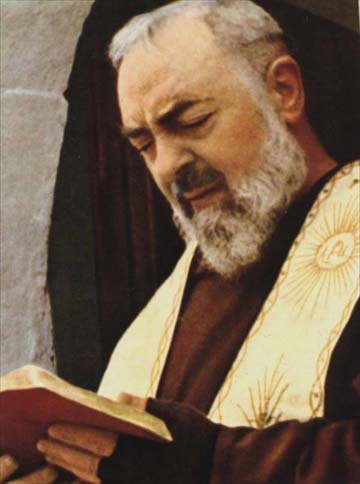 While it is true that no one should aspire to imitate the extraordinary ways of Padre Pio without an explicit call from the Lord confirmed through wise spiritual direction and the appropriate permission when necessary, I believe that the Padre’s life nonetheless constitutes a model of what it means to live as “priest and victim”, a model that all Christians, but priests in particular, should strive to emulate. We shall refer constantly to the priesthood of Padre Pio discovering in his life a rare model of the priestly ideal, an exemplar who revealed in a unique and simple way all the essential features of the priesthood. In short, in an age undergoing transformation in social, cultural and religious spheres we shall look for and find in Padre Pio’s priesthood characteristics of permanent value, unmarked by many of today’s changing values. Now all of this brings us still another time to the conclusion that his vocation to the priesthood, that the fulfillment of his priestly ministry was in relation to his mission to “co-redeem.” I mean that if Padre Pio had not been a priest, he could not have fulfilled his mission: priesthood and mission are identified with each other in Padre Pio. According to a poor interpretation of mine, God did not only want a new victim, but he wanted this victim to be a priest and as such placed in a priestly state like the Incarnate Word. Therefore, it is this state of priest-victim that colors Padre Pio’s priesthood, that makes him exceptional — I will go even further — that makes him unique in the Church up to now. Because we meet many victim-souls in Christian spiritual history. We also know many holy priests, holy priests who took more time to say Mass and shed more tears in doing so than Padre Pio did (e.g. St. Laurence of Brindisi). We know holy priests who have made the confessional their chief ministry. We know holy priests gifted with privileged charisms. We know saints who had marked in their bodies, both in their internal and external organs, the signs of the Passion of Christ. We are astonished when faced with mystical souls who have reached the highest degree of union with God, that which we call the “mystical marriage.” However, a man that summed up, that both lived and suffered all these charisms, a man that could call himself another Jesus Christ with stronger reason than that for which St. Francis was called such, up to now, only Padre Pio is such a man. Now, my dear Father, I want to ask your permission for something. For some time past I have felt the need to offer myself to the Lord as a victim for poor sinners and for the souls in Purgatory. This desire has been growing continually in my heart so that it has now become what I would call a strong passion. I have in fact made this offering to the Lord several times, beseeching him to pour out upon me the punishments prepared for sinners and for the souls in a state of purgation, even increasing them a hundredfold for me, as long as he converts and saves sinners and quickly admits to paradise the souls in Purgatory, but I should now like to make this offering to the Lord in obedience to you. It seems to me that Jesus really wants this. I am sure that you will have no difficulty in granting me this permission. We believe that the juxtaposition of the two words “priest” and “victim” clearly indicates that Padre Pio’s offering of himself as a victim originates with his ordination to the priesthood. We believe, too, that his having received the gift of the “invisible” stigmata only a month later (Sept. 1910), indicates God’s acceptance (Letters I:264f). Hence we can say that Padre Pio’s priesthood is sealed from the very beginning with the sign of victimhood. And, indeed, it is not only a sign that he willingly accepted, but even had asked for. We must hide our tears from the One who sends them, from the One who has shed tears himself and continues to shed them every day because of man’s ingratitude. He chooses souls and despite my unworthiness, he has chosen mine also to help him in the tremendous task of men’s salvation. The more these souls suffer without the slightest consolation, the more the sufferings of our good Jesus are alleviated. Several years later, on 17 October 1915, he writes to Father Agostino: “You exhort me to offer myself as a victim to the Lord for poor sinners. I made this offering once and I renew it several times a day.” From this statement it would seem reasonable to conclude that Padre Pio’s acceptance of his manifold sufferings always included intercession for sinners. 2. Victimhood as consolation to Jesus. Secondly, there is the note of reparation or consolation offered to Jesus. Padre Pio writes of “alleviating the sufferings of our good Jesus”. This is the motive for reparation found especially in the revelations of the Lord to St. Margaret Mary who tells us that he asks for the communion of reparation to his Sacred Heart on the First Friday of the month. Pope Pius XI also deals with this concept in his magisterial Encyclical Miserentissimus Redemptor on the theology of reparation. If, in view of our future sins, foreseen by him, the soul of Jesus became sad unto death, there can be no doubt that by his prevision at the same time of our acts of reparation, he was in some way comforted when “there appeared to him an angel from Heaven” (Lk. 22:43) to console that Heart of his bowed down with sorrow and anguish. In other words, as Jesus saw the sins of the world in his agony in Gethsemane by virtue of the beatific vision, so He also saw in advance every act of consolation offered to him until the end of time. In effect, the act of reparation which we offer now he could see then. This second dimension, too, is notably present in Padre Pio’s understanding of the reason for his sufferings. Here is an instance where he develops this motivation in a meditation on the words of Jesus in the garden of Gethsemane, “Could you not watch one hour with me?” It is fully in line with the theology of Miserentissimus Redemptor which we have just sketched above. O Jesus, how many generous souls wounded by this complaint have kept Thee company in the Garden, sharing Thy bitterness and Thy mortal anguish … How many hearts in the course of the centuries have responded generously to Thy invitation … May this multitude of souls, then, in this supreme hour be a comfort to Thee, who, better than the disciples, share with Thee the distress of Thy heart, and cooperate with Thee for their own salvation and that of others. And grant that I also may be of their number, that I also may offer Thee some relief. Not surprisingly, even in this meditation which is oriented to consoling Jesus, a reference to cooperating in our own salvation and that of others is not lacking. The two are intertwined in Padre Pio. He makes the offering of himself in the state of victim similarly for his Capuchin Province, and asks Padre Benedetto for permission to do the same on behalf of aspirants for the Province. He also informs Padre Benedetto that he has made an offering of himself for the intention which Pope Benedict XV had recommended to the whole Church. It is interesting to note that all of these acts of self-oblation were made before the definitive experience of the stigmata which he received on 20 September 1918 and which marked his body for fifty years. Perhaps it is not inappropriate here to ask some questions about all of these acts of making himself a victim for particular individuals or intentions. How could Padre Pio offer himself totally for more than one person or intention? In a human manner of speaking, would he not lessen the amount of merit available for a particular person or intention the more he multiplied the dedications of his victim hood? How could he multiply virtually to infinity the various purposes for which he suffered? Mathematically speaking, would he not have been reducing the effects of his suffering with every new intention which he took on? I was hardly able to get to the divine Prisoner to say Mass. When Mass was over I remained with Jesus in thanksgiving. Oh, how sweet was the colloquy with paradise that morning! It was such that, although I want to tell you all about it, I cannot. There were things which cannot be translated into human language without losing their deep and heavenly meaning. The heart of Jesus and my own — allow me to use the expression — were fused. No longer were two hearts beating but only one. My own heart had disappeared, as a drop of water is lost in the ocean. Jesus was its paradise, its king. My joy was so intense and deep that I could bear no more and tears of happiness poured down my cheeks. Yes, dear Father, man cannot understand that when paradise is poured into a heart, this afflicted, exiled, weak and mortal heart cannot bear it without weeping. I repeat that it was the joy that filled my heart which caused me to weep for so long. 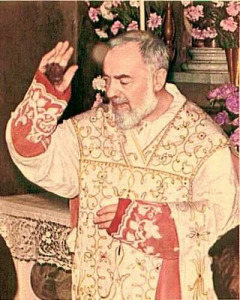 While the entire earthly life of Jesus constituted a continuous offering of himself to the Father, “nevertheless the victim state of the Lord reaches the sacrificial apex at the immolation at Calvary.” In an analogous manner we way say that, while the entire priestly life of Padre Pio was lived as a victim, nevertheless his victim state reaches the sacrificial apex at the celebration of the Mass. Let us consider these statements of Padre Pio about his Mass. Not only did Padre Pio experience his greatest suffering during the celebration of the Mass, but it was also for him the time of his most intense intercession. As on the cross Jesus could see all of us in the beatific vision, so Padre Pio seems to have had a similar gift. According to Father Schug, the Padre once said that in this absorption in God, especially at the Consecration of the Mass, he saw everyone who had asked his prayers. He told his friends that they could always reach him when he was at the altar. He saw them, actually, in his gaze on God. Again, once asked “Padre, are all the souls assisting at your Mass present to your spirit?”, he answered “I see all my children at the altar, as in a looking glass.”Indeed, because the priest is a mediator, it is his responsibility to pray for the people of God. Padre Pio took this as a solemn obligation and, even though the petitions pouring into the friary of San Giovanni Rotondo were countless, he faithfully honored every request for prayer. His intercession was — and is still — so powerful precisely because of his priest-victimhood. The seriousness with which he took his role as intercessor should be an admonition to every priest. This brings us to a subject of capital importance: Padre Pio and priests. The Lord has confided to many victim-souls that his priests are “the apple of his eye”, yet so often they are so far from fulfilling what he expects of them. Not surprisingly, very early in his state of victim hood, Padre Pio was called to make reparation for priests. Here is an account which he made to Padre Agostino, his spiritual father, on 7 April 1913. On Friday morning [28 March 1913] while I was still in bed, Jesus appeared to me. He was in a sorry state and quite disfigured. He showed me a great multitude of priests, regular and secular, among whom were several high ecclesiastical dignitaries. Some were celebrating Mass, while others were vesting or taking off the sacred vestments. The sight of Jesus in distress was very painful to me, so I asked him why he was suffering so much. There was no reply, but his gaze turned on those priests. Shortly afterwards, as if terrified and weary of looking at them, he withdrew his gaze. Then he raised his eyes and looked at me and to my great horror I observed two tears coursing down his cheeks. He drew back from that crowd of priests with an expression of great disgust on his face and cried out: “Butchers!” Then turning to me he said: “My son, do not think that my agony lasted three hours. No, on account of the souls who have received most from me, I shall be in agony until the end of the world. During my agony, my son, nobody should sleep. My soul goes in search of a drop of human compassion but alas, I am left alone beneath the weight of indifference. The ingratitude and the sleep of my ministers makes my agony all the more grievous. In the annals of the mystics there are no few such plaints recorded as coming from the lips of our Redeemer. The ones from whom Christ looks most of all for consolation, particularly priests, are often precisely the ones who are the most indifferent to his loving plea for reparation. Tragically, some add contempt and unbelief to their indifference. I believe that this vision which Padre Pio had in the early days of his priesthood was highly prophetic. If it was true in 1913, it can be verified, I believe, much more readily today. Indifference, contempt and unbelief have ravaged tens of thousands of priestly souls, unleashing an extraordinary tide of devastation upon the Church. Have we reached “high tide” yet? Only God knows and only he can respond. What is needed to turn the tide? More than anything else, I believe, are priest-victims. When one considers the growing impact which the humble friar of the Gargano continues to have even twenty-seven years after his death, can one doubt that a legion of priests who willingly embraced victimhood, as he did, could change the face of the Church? I am convinced that there is no greater need facing the Church today. With what ingratitude is my love for men repaid! I should be less offended by them if I had loved them less. My Father does not want to bear with them any longer. I myself want to stop loving them, but … (and here Jesus paused, sighed, then continued) but, alas! My heart is made to love! Weak and cowardly men make no effort to overcome temptation and indeed they take delight in their wickedness. The souls for whom I have a special predilection fail me when put to the test, the weak give way to discouragement and despair, while the strong are relaxing by degrees. ‘They leave me alone by night, alone by day in the churches. They no longer care about the Sacrament of the altar. Hardly anyone ever speaks of this sacrament and even those who do, speak alas, with great indifference and coldness.